Do you love your Swiffer? Do you even have one? I never did until I moved into a house with tile floors, because I previously had always had carpet. So of course everyone said, “Now you need to get a Swiffer.” So I did. But I ended up using my vacuum to get up all the dust bunnies and dirt. I did like the wet Swiffer things to help clean up sticky stuff. I just hated the thought of buying and throwing away all those cleaning cloths. So what I’ve ended up doing is using a re-usable microfiber cloth (like you can get at Costco in a huge bundle) and I wet it. You can use some kind of spray as well, if you like, but for me it’s straight water (and sometimes a little vinegar). Go ahead and get it really wet, and wring it out. Then just pop it onto your Swiffer! Let the edges dangle, that’s just fine. In fact, I find that they help catch any stray dust around the sticky parts even better. And you can even turn it over and use the other side. Really, it’s OK. Cleaning the floor while saving money AND the planet at the same time? This entry was posted in Uncategorized by organizedohana. Bookmark the permalink. Feel the same about Swifters and disposibility. 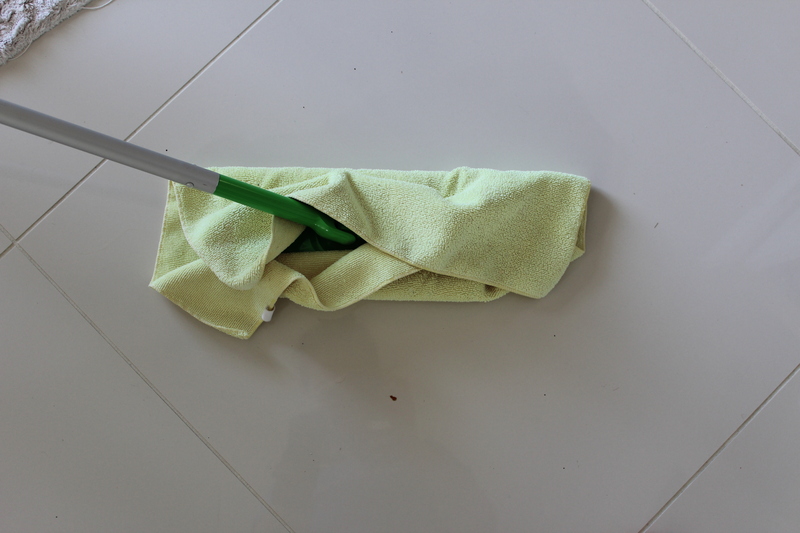 Will use my Swifter mop with my microfiber wipes now and rinse and reuse. Thanks, Jennifer!